Alyssa Garcia at bat for the Bulldogs. Butler managed only two hits in the loss to Miami. Jimmy Lafakis/Collegian file photo. 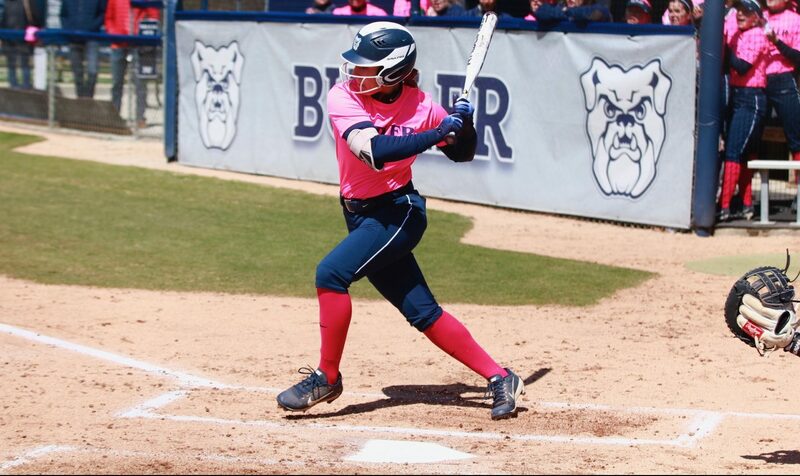 The Butler softball team moved to 9-17 on the season as they fell 4-0 to Miami (Ohio) on March 20. It was the Bulldogs’ final tune-up before their Big East conference and home opener on March 23. In a game that saw each of Miami’s three pitchers see action, the Bulldogs’ offense was stymied in the shutout loss. The Redhawks staff struck out nine batters and only allowed two hits in the matchup. Butler’s best shots to break through came in the third and the sixth innings as a pair of runners were on base. Miami halted both rallies with a strikeout. With Karli Ricketts in the circle for the Bulldogs, the Redhawks got work right away in the first inning as Haeley Tran doubled into left field. Two at-bats later, she scored on a hard hit ball to Butler shortstop Claire Gilliland. Miami followed that up with a double from Lily Wilmot to lead off the bottom of the second inning. She later scored off a sacrifice fly to right field. The Redhawks rounded out their offensive output with two runs in the fourth inning off a single from Wilmot and a double from Kara Leckinger. Senior Kaitlin Doud pitched 2.2 relief innings for the Bulldogs after Ricketts was pulled in the fourth inning. She held the Redhawks scoreless off one hit and struck out two batters. Gilliland and Sammy Andersen each had a hit for the Bulldogs. Following the loss, the Bulldogs will host DePaul for a three-game series to open Big East play on March 23 and 24.